Men and muscle cars alike will be celebrated at the 8th annual “Hot” Wheels Fatherhood Event and Car Show on September 18, 2015 from 4-7 pm. The event will take place rain or shine at the Clare City Park across from City Hall in Clare, Mich. and is sponsored by Mid Michigan Community Action Agency (Mid Michigan). “The significance of men in the lives of families and young children is substantial,” said Sue Harvey, early childhood services director. The U.S. Department of Health and Human Services affirms this by stating that male-involvement creates positive responses in children such as better performance in school and healthier behavior. “This event is just another way Mid Michigan brings families together,” added Harvey. Over 30 classic cars will be on a display, including a ‘68 Pontiac Catalina and a ‘56 Willys Pickup—to name a few. Registration is still open for those who have a “Hot” car to show off. Attendees will cast their vote for their favorite cars. Four dreamy cars will win a trophy commemorating their win. 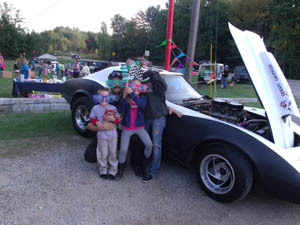 Families will enjoy more than “Hot” cars, including games and activities along with free food, door prizes and community resources. The MI-CHIP service will allow parents to create a child ID packet that includes their child’s fingerprints, picture, video and other vital information. Quality Preschool Partnership will be signing up children who live in Clare and Gladwin counties for free preschool in the fall. To learn more about this event or to register your car contact Shawna Roskoski at (989) 386-3805 ext. 1052.